TJ13 is now also on Facebook. Like us in the toolbar on the right if you’re a FB’er. F1 Forensics is brought to thejudge13 readers in partnership with SomersF1, Like most of us, Matthew Somerfield has a day job and his is being the manager of a car & van rental company in the Isle of Wight. His passion is to try and bring us non-techies closer to F1 by bridging the gap between the full blown engineering publications and the simplicity of much that is provided by TV. Ask Somers anything you want in the comments section. He’s part of the crew now and hang’s out here regularly. Somers has been working seriously hard the past few days and his marathon is almost run. Even if you don’t regularly comment say Hi to him and make him feel as though his work has been worth it. The STR8 is probably one of my most anticipated launches as the car will be distinctly different to it’s predecessor that utilised a double floor configuration. This was achieved by raising the whole of the Sidepod from the floor in order to allow an un-encumbered flow to the rear of the car, the problem however is this compromised the car’s packaging and raised the CoG. The STR8 has been designed with a vanity panel and really takes on board the image of what you would believe the FIA were originally intending for the nose rules. The nose tip is set relatively low suggesting the vanity panel only covers the upper section of the nose much like their sister car the RB9. 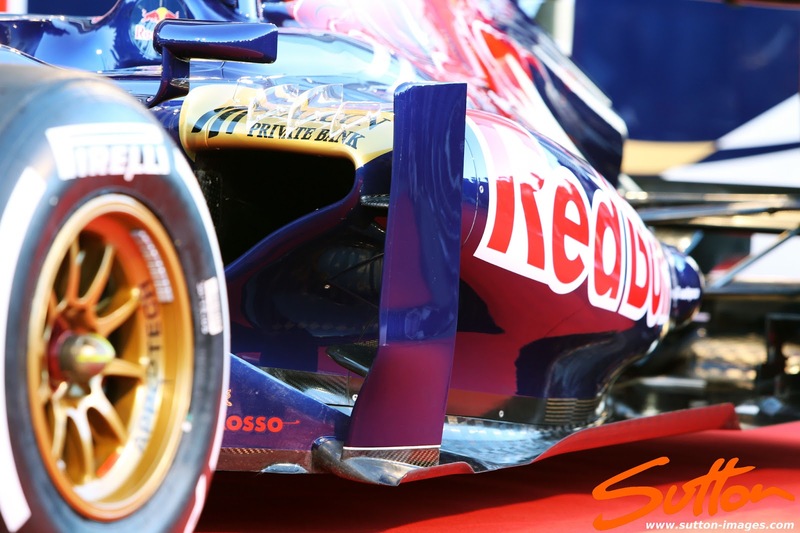 The Sidepods although clearly not the same as the STR 6/7 are aggressively packaged with a large undercut running from the front to the back of the car. On top of the Sidepods we see the team have retained their clear Vortex Generators which guide and vorticise the airflow down over the Sidepod toward the exhaust. The team have presented the car with the Semi-Coanda exhaust used throughout the latter part of last season with the Sidepods exiting airflow moved rearward into the Coke Bottle region. 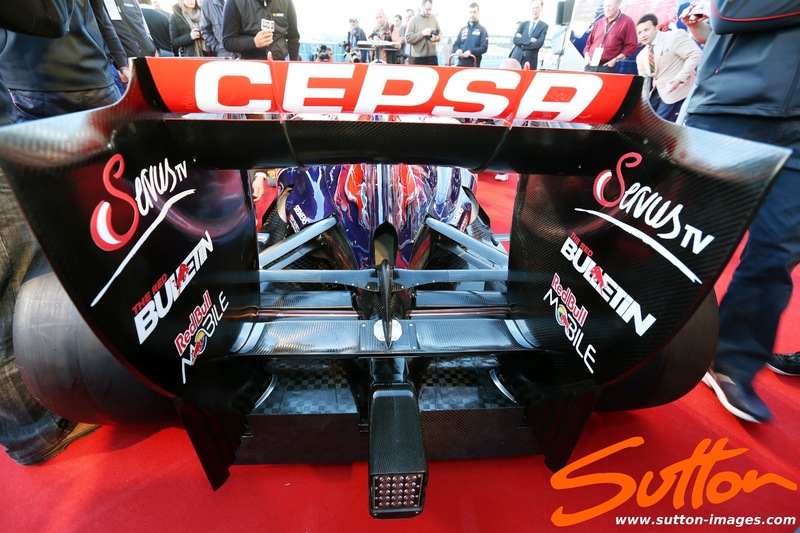 The Floor Scroll runs alongside the central section of the floor where the Sidepod is at it’s widest point. Based on the RB9 launch yesterday I doubt it will be long before we see a perforated version here in order to enhance it’s characteristics. Unlike their sister team and most of the field have this season the team have not converged on the shrouded halfshaft but increased the height of the Wishbone with the Halfshaft lined up directly behind it. This leaves a much cleaner space for the air to flow under into but lacks the removal of the Magnus Effect which impinges on the Diffusers performance as the floor is presented with an inconsistent exhaust plume. A singular Strake mounted 3 or 4 inches from the floors edge (inside the wheel) helps to navigate flow above the floor. This will work in combination with the Brake Duct vane which hangs over the floor to vorticise the airflow. Like Mercedes we can see that Toro Rosso have also scalloped out the coke bottle region allowing a more defined pathway to the central area and starter motor hole. Yeah so did I, as far as I can see it is the veering off course of say a golf or tennis ball due to the spin on the ball and the gas/air dragged round with it causing different pressures and friction on each side of the ball along it’s trajectory, consequently bending the trajectory to the side with the most drag, this being the leading side which is spinning in the direction of travel. On the car the greatest drag on the tyres from this effect will be at the top, thus lift will be created. Put simply the rotation of the halfshaft presented with airflow in a laminar fashion will create downforce by creating a higher and lower presure region than if the airflow continued un-encumbered. 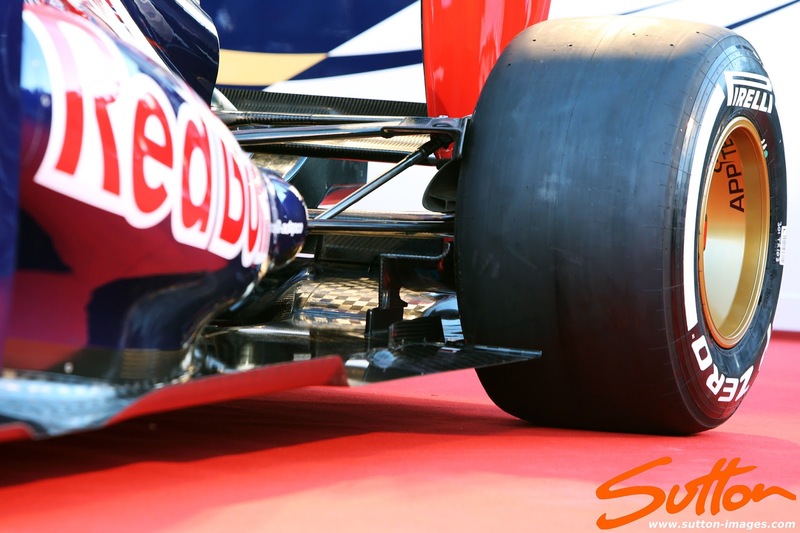 Newey has been shrouding the halfshafts on RBR’s car’s since the RB5, in order to remove the Magnus Effect from the rear of the car. Why? I hear you ask 😉 The exhaust plume although great for helping to increase downforce is eratic (due to the time the driver is off throttle) the major reason the teams pushed the boundaries with off throttle blowing. This means the exhaust plume doesn’t provide a laminar flow to the halfshaft, in turn it means the stagnation point is constantly changing resulting in an on/off creation of the Magnus effect. The Magnus Effect is also an in-efficient way of creating Downforce as the drag it creates is relatively high. Lastly and something I had confirmed when speaking to Andrew Green (Force India Technical Director) by incorporating the halfshaft within the Lower Wishbone they can raise the Lower Wishbone further off the floor, further un-encompasing the exhaust plumes flow over the rear of the car. 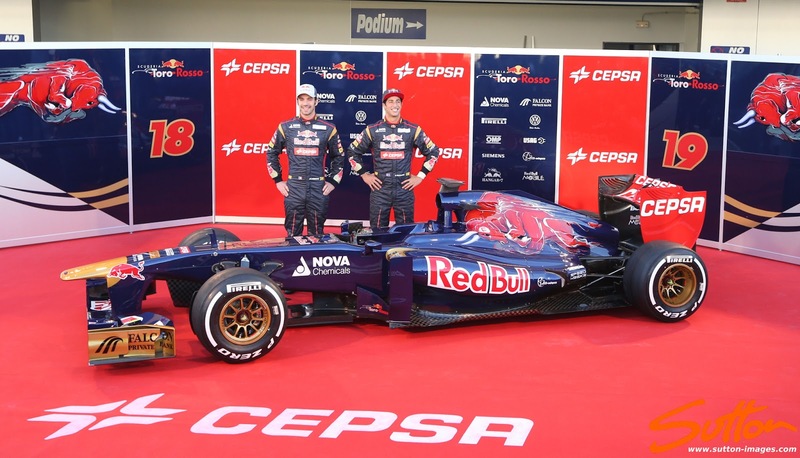 Ah so this year it will be possible to identify the Red bull vs Torro Rosso. 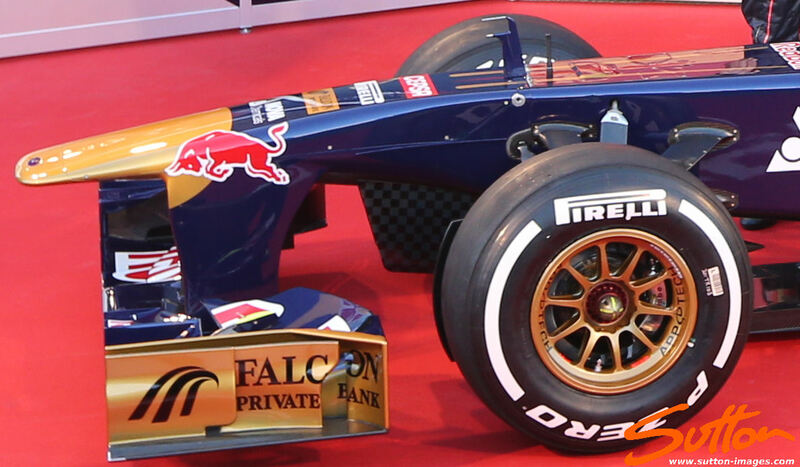 The Torro Rosso has “Red Bull” on the sidepod and the Red bull doesn’t, nice and clear that! Excellent article as ever Matt. I always felt that the little brother Red Bull team is more Italian as others going for looks over other things. For instance their insistance of using clear vortex generators! Solid ones are far too ugly and ruin the flowing lines.